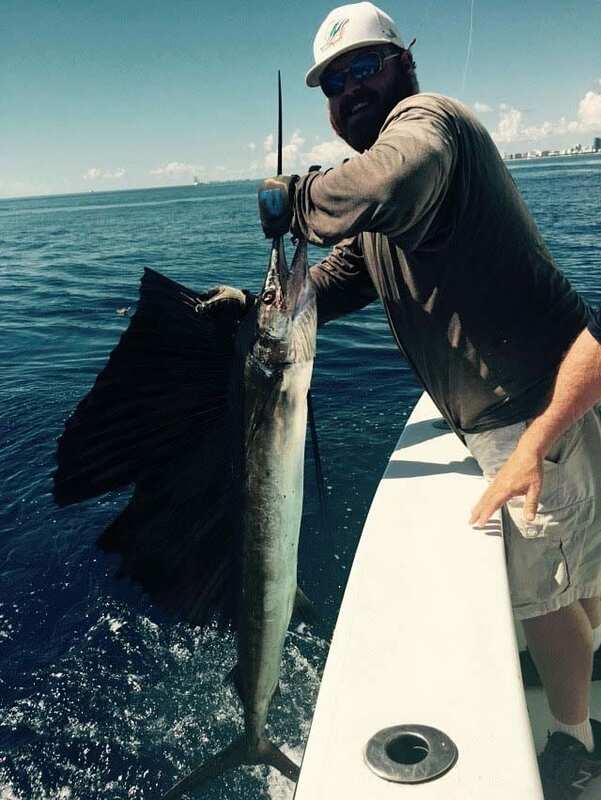 Miami Fall Fishing Sailfish Wahoo Sharks and Kingfish… The seasons are changing and so is the fishing. As the water temperature begins to fall, the air temperature north of us drops the bait fish start their migration. Right behind the bait fish are the Game Fish. Sailfish, Wahoo, Sharks & Kingfish are all migrating through the waters just off Miami & Miami Beach. This time of year we are catching Sailfish, Wahoo & Kingfish trolling. We are seeing large schools of Ballyhoo on the edge of the deep Reef. Although we typically switch from Bonita strips to rigged ballyhoo when we see the bait schools move into our area. Single hooked Ballyhoo rigged with skirts, chuggers & sea witches on the surface in the riggers. We fish double hooked Ballyhoo with similar lures on the planers down deep. 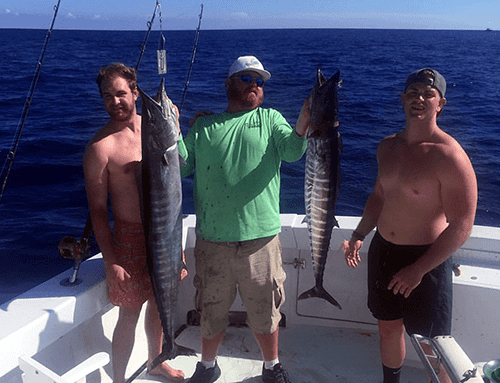 We typically catch the Sailfish and Wahoo’s on the surface rigger baits. Although we do catch a few larger kings on the surface this time of year. We set our planers to dive between 30 feet and 60 feet below the surface. We see most of our Kingfish action on the deep planer baits. Our deep baits are also a great place to target and catch wahoo. Shark fishing off Miami & Miami Beach has also picked up. Out past the deep reef are quite a few wreck the lie broken on the bottom in almost Miami Fall Fishing Sailfish Wahoo Sharks200 feet of water, out to almost 400 feet of water. In the Fall we begin to see more Sharks out near the wrecks. A well as migrating through the Miami area out near all of these wrecks. We target sharks with a combination of dead baits like small assorted Tunas, Mackerel & Kings. We also fish live Bonito’s also called “Flips or Bullets”. The dead baits are fished in multiple locations. On the bottom, in the middle of the water column and on the surface. We fish the live baits on the surface and or below the surface on a down rigger.